MONROVIA – Former Supreme Court Justice Philip A. Z. Banks, III, who Thursday, March 21, appeared as an expert witness in the ongoing impeachment trial against Associate Justice Kabineh Ja’neh, has said that any action taken by the Senate in support of the House of Representatives’ decision to impeach Justice Ja’neh could be challenged in the court based on its constitutionality. Justice Banks said it’s been more than 33 years since the adoption of the 1986 Constitution but the Legislature has failed to adopt a rule for impeachment as required by Articles 43 and 29 of the Constitution and that the actions to adopt one when a case of impeachment had already started is unconstitutional. 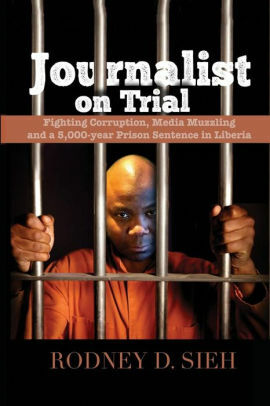 According to Justice Banks, who is also a law professor with vast experience in the legal arena of Liberia and international law, the rules for impeachment as required by the Constitution, should have been crafted six months after the 1986 constitution was adopted by the nation. According to Witness Banks, before the 1986 Constitution, the 1847 Constitution calls for impeachment of justices of the Supreme Court by a resolution signed by both houses of the legislature and sent to the President who will inform that Justice that he or she has been removed as a justice of the Supreme Court. Retired Justice Banks believes because the framers of the 1986 Constitution saw this act as political and one that compromised the independence of a justice of the Supreme Court Bench, they changed the proceeding for justices of the Supreme Court to be impeached through “due process,” which would require a rule adopted by the legislature in uniformity and not separately. 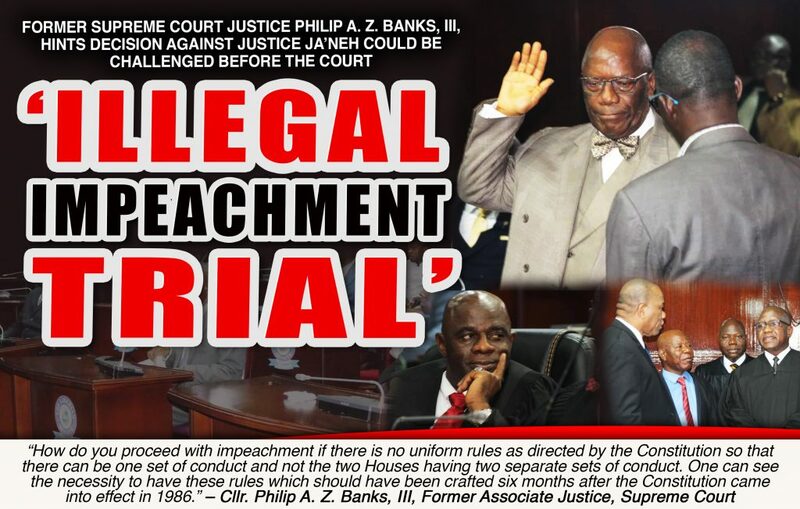 Justice Banks was called in by the defense lawyers of embattled Associate Justice Ja’neh to give his expert opinion on the constitutionality of the ongoing impeachment especially being one of the major actors in one of the counts Ja’neh is being accused of. This count has to with the Road Fund. “In this case, not only did the petitioners say that the House of Representatives was without rules of procedure on the way to proceed, but also prayed the House to have rules adopted, even though the proceedings had already commenced. “But more than that, and the reason I mentioned these is because in the absence of rules, the Speaker assumed the authority to appoint an ad hoc committee to go and investigate and come back with findings. During the committee’s investigation, it did not care to require the appearance of the Justice and did not threaten to proceed by default. “How do you proceed with impeachment if there is no uniformed rule as directed by the Constitution so that there can be one set of rules and not the two Houses having two separate sets of conduct? By this, one can see the necessity to have these rules, which should have been crafted six months after the constitution came into effect in 1986. “The framers were aware that the rules of procedure were important in order to prevent arbitrariness so that no impeachment will be undertaken because one thinks I am ugly or because one doesn’t like me or I render judgment against your relative. If there were these rules of procedure, the Legislature would be under obligation to abide by them in order for impeachment to be legitimized. This Mr. Chief Justice is important because if what the House of Representatives did is illegal or unconstitutional, any action by the Senate will face challenge of legality and constitutionality,” Justice Banks opined. Defending his action to issue a writ calling for stay order on the collection of tariff on petroleum imposed by the Government of Liberia to be collected by importers of petroleum products, Justice Banks said he did so in keeping with the constitution that gives to the Legislature only the power to impose tariff and not Executive through a Cabinet Retreat. According to him, after all efforts by him as Justice in Chambers to have the government and importers amicably handled the issue to have the legislature played its constitutional role, the officials of government (executive) failed to followed leaving him with no option but to issue the writ because he saw it as a blatant violation of the Constitution.